Gulmarg is yet another beautiful hill station in Jammu and Kashmir. Popular during the winter season for enjoying snowfall and indulge in snowboarding and long-run Skiing. Summer is ideal for enjoying the scenic beauty along with various adventure sports. Gulmarg, literary meaning meadow of flowers, is a majestic hill station in the Baramulla district. 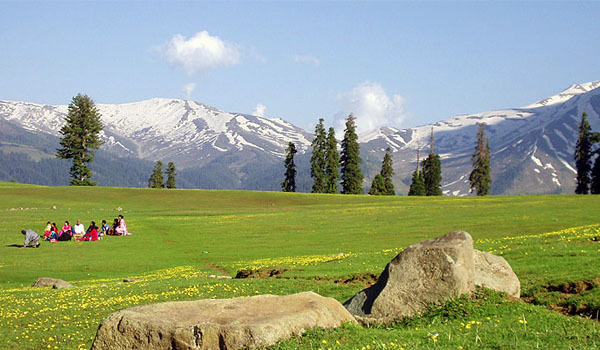 Nestled with stunning peaks in the Himalayan ranges, Gulmarg is a spectacular picnic spot. With its lush green backdrop, flowering gardens, serene lakes beautiful landscapes it is pleasant getaway during the summers and falls. This imajestic hill station was once a pleasure resort for kings and royal family members. It was also a summer retreat for the British officers, during the British rule in India. History reveals that Mughal emperor Jehangir was a frequent visitor to this pleasant place. Gulmarg has a picturesque surroundings, beautiful gardens with many varieties of flowers and fragrance. It is one of the best ski resorts in India and some of the highest ski slopes in India lies in these sloppy Himalayan regions. The beauty and the tranquil surrounding makes it must visit tourist destination.